So, I’m back with another refreshing frozen summer treat for you! It’s funny cause when I had a recipe blog I used to never post on it, but now that I have a blog that’s not particularly about recipes, I can’t stop doing recipe posts. Whatever. 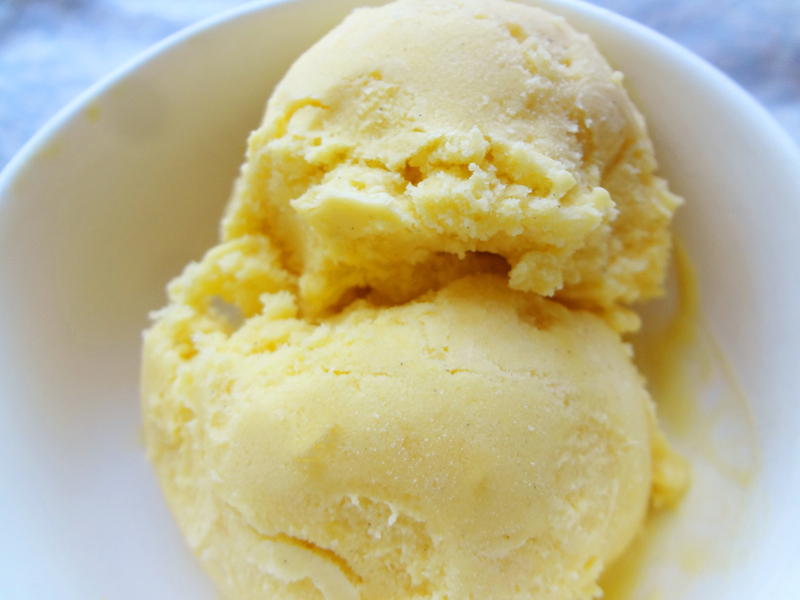 This mango ice cream is freaking great and you should all eat it. I’ll never forget the first time I tasted a mango lassi. I was 21, with my friend Juliet at the newly-opened Basmati Restaurant in Champaign, Illinois. It seems crazy, considering how many Indians live there, that this was Champaign-Urbana’s first Indian restaurant. Growing up, my only experience with Indian food was from my mom’s kitchen, a white girl from suburban Chicago. Her curries were delicious (if a little unorthodox), but she never introduced me to the joys of naan, chicken masala, or glorious lassi. Though I moved away from Central Illinois a few days later, I ended up in Rogers Park in Chicago, a mere 10 minutes from Devon Avenue and Chicago’s Little India. So basically I’ve drunk like 300 mango lassis in my time and it’s a serious hardship living in a town where the only Indian restaurant went under 11 months ago (RIP India Palace). Amazing, right? So anyway, you do that to 2 mangoes, and then purée them in your food processor. 1) Slice and peel mangoes. 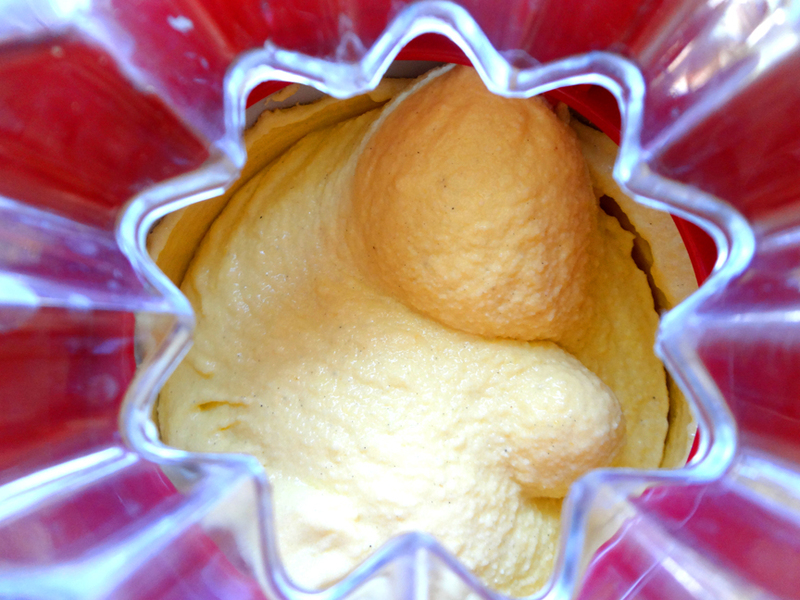 Purée them in a food processor until smooth. 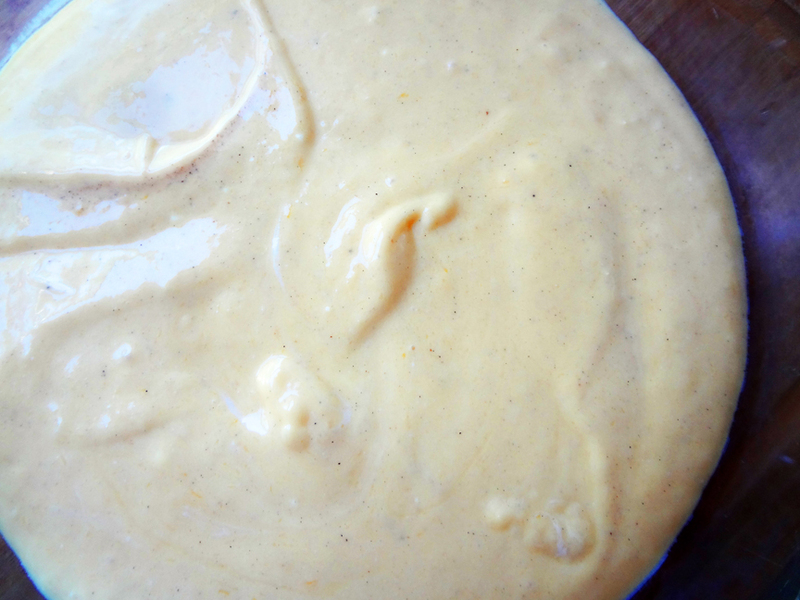 2) Transfer mango purée to a large bowl. Add the rest of the ingredients and mix well. 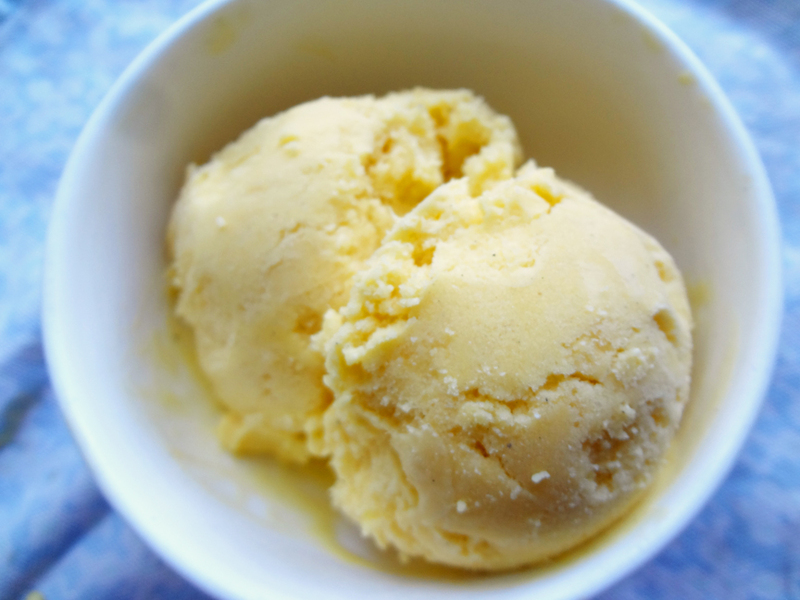 3) Pour mixture into ice cream maker and churn until it looks like soft serve ice cream. Transfer to a lidded container and freeze at least 3 hours. Popsicles are one of those things you can pretty much make without a recipe. Take some sweet stuff, freeze it with a stick coming out, enjoy. So I feel a little sheepish sharing what is an extremely simple “recipe” – only four ingredients in fact, but these were way too delicious to keep to myself. It’s basically frozen piña coladas, with maple syrup instead of rum, and chia seeds for some extra texture/protein/hippie cred. The flavor reminds me of this amazing soft serve pineapple ice cream they used to serve at the Champaign County Fair back in my central Illinois youth. Creamy, tropical, and sweet, with just a bit of tang. If you haven’t worked with chia seeds before (aside from making a terracotta-based shrubbery back in the 80s), they are totally weird. When you put them in something wet, they get this swollen gel-like coating around the seed. I’m making it sound kind of gross, but they’re actually quite yummy. Like a mix between a tapioca ball and a kiwi seed. But it takes a while for them to swell, so mix a few tablespoons of chia into one can of light coconut milk, and then stick it in the fridge for a few hours. Meanwhile, chop up your pineapple. Once you’ve cut off the tough outer skin, you can give your leftovers to your sous chef for her to practice her knife skills on. Cut the bald pineapple into quarters, lengthwise, and trim out the tough core. We don’t want any fibrous bits in our creamy frozen tropical heaven. Cut into chunks and purée. 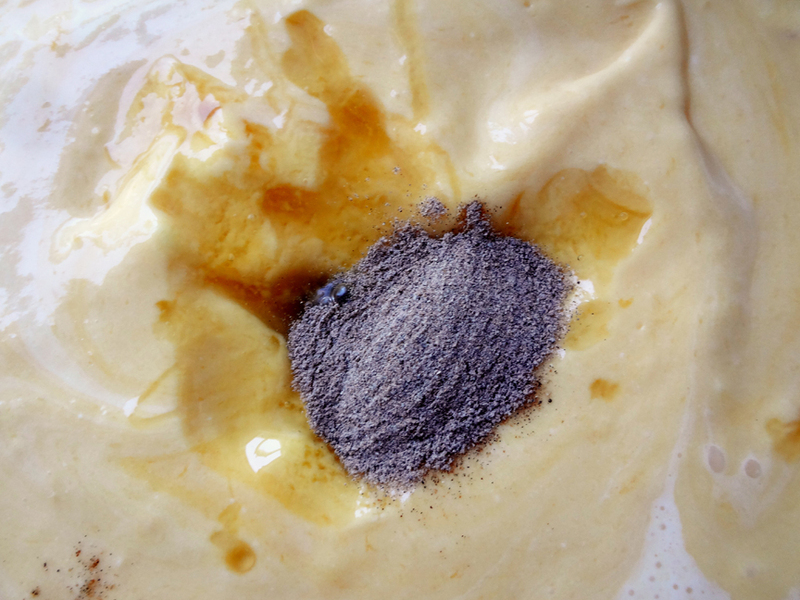 When your chia-coconut mixture is ready, mix with the pineapple purée, along with a goodly amount of maple syrup. How much you need depends on how sweet your pineapple is. Mine was super ripe, so I used only about 1/4 cup. And finally, pour into molds and freeze over night, or at least 5 hours. That’s it! Easy peasy. These are best enjoyed in a warm breeze, with eyes closed and some Ramito playing in the background. 1. 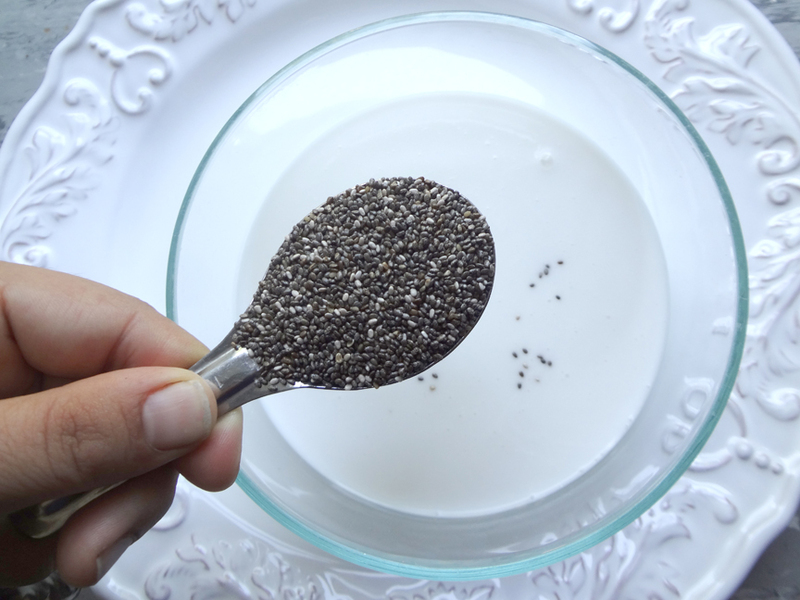 Mix the chia seeds into the coconut milk. Cover and refrigerate for at least 4 hours. 2. Cut the tough outer skin and eyes from the pineapple. Quarter it and cut the tough core out of the inner corner of each pineapple quarter. Cut into chunks and purée in food processor. 3. 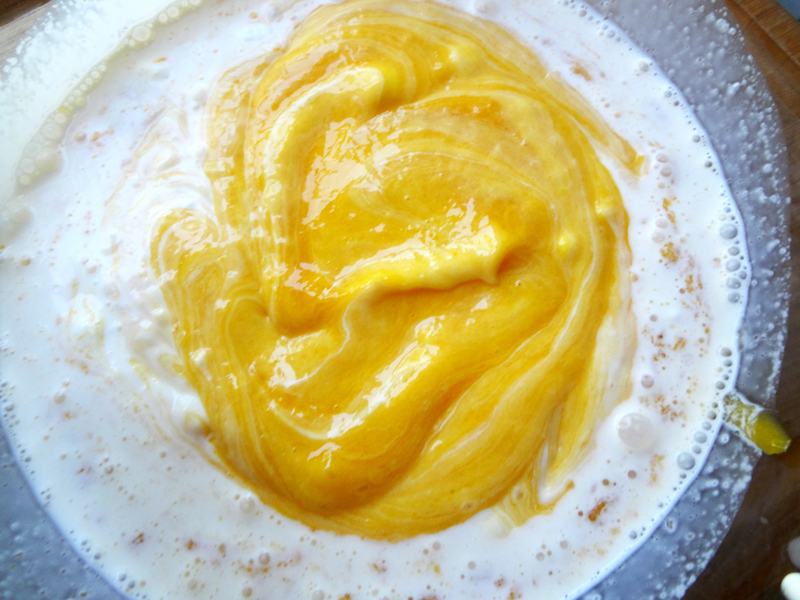 Combine coconut-chia mixture, pineapple purée, and 1/4 cup maple syrup in a medium-sized bowl. Stir until well blended. Taste it. Add more syrup to your liking, if necessary. 4. Pour into popsicle molds (or, if you don’t have any, paper cups with a popsicle stick stuck in for a handle will do just fine). Freeze at least 5 hours. To unmold pops, run hot water over the outside of the mold until the popsicle slides out easily.